Mae Sai, or locally more often, Maesai, (แม่สาย) is the northernmost city of Thailand. It is mainly a stepping stone for visits to Myanmar and has few attractions of its own. Maesai has a pronounced wet season during which it is likely to experience flooding 2 or 3 times. The Ruak River rises quickly and falls almost as quickly. It is not uncommon for there to be some flooding in the centre of town, but not the border crossing itself. On 5th September 2014 there was a heavy overnight storm which caused an exceptionally high river flow and flooding and the river flowed over the border bridge (in the picture). Some of the market areas are especially low lying and suffered worst. Many of the accommodation places described in 'sleep' also suffered though few appeared to suffer damage to their guest rooms - some exceptions are noted below. Buses from Chiang Mai take about 4 hours (210 baht one way). All public buses terminate at a bus station well south of Mae Sai (Maesai), so you have to continue onward to the city proper with red songthaews waiting at the bus station (15 baht per passenger fixed fare). The blue songthaews to/from the Golden Triangle and Chiang Saen (50 baht, 45-60 minutes), on the other hand, leave from a stand in the city centre a few hundred metres down the street from the border in front of the pharmacy on the corner of Thessaban Road Soi 8. The last blue songthaew that departs for Chiang Saen leaves at 2PM. There are also day-tours taking visitors from Chiang Rai to Mae Sai, the Golden Triangle, and a couple of other places to see on the way as well. Tourist minibuses are more expensive (around 800 baht for a day tour from Chiang Mai including lunch) and, if fully loaded (but this is not always the case), are much less comfortable. However, this is still an option worth considering, if you want to combine your visa run with a sightseeing tour through Chiang Rai province. By car which can be rented in Chiang Mai (4 hours away) and other cities. Mae Sai is 61 km from Chiang Rai on Highway No. 1. There are several minibus services which run between Chiang Mai and Mae Sai, tickets for which can be purchased at most tourist and travel agencies in Chiang Mai. Prices are approximately 700 THB for the round trip which takes 5 hours each way, with a 1-2 hour stopover mid day as people cross the border for shopping and re-entry stamps. Mae Sai is quite small and can easily be covered on on foot unless you stay in accommodation well out on the road from the south, or you want to travel to the Tesco supermarket almost at the bus station. Mae Sai is quite an underestimated town as many visitors just breeze past it on their way to the Myanmar border on a visa run. But if you would like to visit an authentic Thai border town there is much to see here for you. Visit the markets all around the town centre: they are large and carry a good range of clothing, electronic goods and so on. Take a picture at one of the signs marking the northern most point of Thailand. There's one just to the east of the border road up one floor by some shops and another on Thetsaban 21 (see above and in accommodation section). Stop at the entry point and talk with the Thai officials to organise to cross the bridge into Tachileik Province, Myanmar (which the Thais call Tha Khi Lek ท่าขี้เหล็ก). Talk with the Thai officials to organise this: it is easily done. An entry permit valid for up to 14 days costs 10 US$ but the official will often ask for 500 baht as it is worth more or otherwise try to charge you more. Travellers using this option are given a paper entry permit and their passports are held at the immigration office until they return to Thailand. (Check this as this is now a recognised crossing point if you have a visa in advance and you can now enter Myanmar here - however one report says you cannot travel on by road but must fly out. 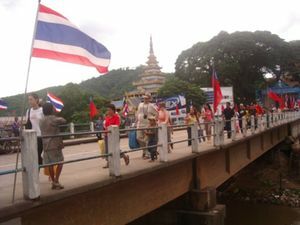 If you are crossing into Tachilek purely to exit and then re-enter Thailand, (the visa run) the paper pass can be skipped and you can walk across the street to pick up your passport and walk directly back across the bridge and to re-enter Thailand. Rent a motor bike (MaeSaiScooters), for 200 baht and drive through the mountains. Take the first left just before the border and just keep driving - it is one of the most scenic drives you will find in Thailand. Fuel up as you can expect a 100km ride if you ride the whole loop back to Mae Sai edit: july 2015: this border road looping around doi tung is under serious maintenance and is blocked 10km from mae sai, there is a new road going up to doi tung starting 13km south of mae sai, in very good shape and less steep than the former road (shorter, steeper, narrower, but still usable). Sit at a local restaurant and watch the fascinating comings and goings of a border town, Burmese people, merchants and all! Kik Kok restaurant is about 1Km up from the border on the right as you walk in that direction and there are a few Thai restaurants about this distance along the main road away from the tourist shops near the border. It closes about 8pm. The one immediately next door, run by Chinese descent people will give you a good feed quite cheaply even later, with alcohol if you want it, and the menus are easy to work on. They are either in English or with pictures of what you get. A few hundred metres further on the same side of the main road, opposite Chour Palace Hotel, is Jee Jee restaurant with good and reasonably priced food specialising in fish dishes. They have an English menu, but there's no English sign except the unmissable ones pointing to the toilets. Those wanting a fix of comfort food can visit the new Hongfah Plaza, a small shopping mall off the main street, about 500m on the right as you walk from the border. There's an ice-cream parlour, Black Canyon Coffee and some bakeries selling cakes and sandwiches. Anantapura. This pleasant restaurant is probably the classiest in town. On a hillside, on a road that runs parallel to, and is about 1 km west of, the main Pahonyothin Rd, the views down the narrow valley are stunning with the Shwedegon chedi accross the border in Myanmar lit up at night. Be sure to try the smoked duck curry. Service can be slow but this is not a restaurant to come to if you are in a hurry. Doi Wao Temple. In front of Doi Wao Temple (The scorpion temple just above the market stalls of Chinatown) there are two food stalls selling excellent noodle dishes. One, run by a short middle-aged plump woman, sells Khao Fuen (Shan style made with blocks of tofu and in a soup or a yam-spicy salad-style) and the other is run by an older skinny Thai Lue woman usually wearing a wide straw hat who sells excellent nam ngiew noodles Yunnan style and very good Khao Soi Thai Lue style. There are several comfortable coffee shops on the main road leading to the immigration checkpoint. There's little in the way of bars are some nice bars and nightclubs in town (which seems to be suffering from a slackening of business) but the Maesai Complex Hotel (see its entry in 'sleep') runs an outside bar in the evenings. There are few budget places in the usual booking sites so the following is offered (September 2014). In general, the price/standard is not as good as many other Thai towns. Prices are for rooms with a fan but no aircon quoted in September 2014 which is off season. To the west of the border crossing along Thetsaban 21 which passes along the edge of the market, is the greatest concentration of budget accommodation. Off season prices are mostly 250 to 350THB. First is an unnamed (in English) guest house on the left still within the market. Next on the left and still in the market is S House Hotel, no details except that it is in the budget range. Also on the left is Bamboo House, just before the first trees and the OK Restaurant . It has been recently been partially renovated. It's basic and has the cheapest rooms, from 200 THB though they are a touch gloomy, but there's nothing cheaper and they have nothing actually wrong with them though short on the nice to have features (wardrobe, outside tables) and little English is spoken by the rather unenthusiastic staff. On the right after the long closed Monkey Island Bar is the YeeSun Hotel with prices from 400THB, a barnlike lobby with just a couple of chairs and rather unenthusiastic staff. On the right is AQ House. Prices from 300 THB and reasonable quality. 089-4322220. You will come to a 'Police Checkpoint' but it seems to be simply a small 'cop shop' though in several days when we were there the only observed activity was to receive a corpse floated across the river from Myanmar! Finally, there's the Maesai Guest House which is more of a resort with individual A-frame bungalows from 350 THB off season, 500 THB high season. A pleasant owner, a bar and restaurant, and bungalows right on the river provide appeal to many travellers. In September 2014 the low lying bungalows and reception/bar were very badly hit, but as of February 2015 they have been restored and the WiFi is still excellent, but come rainy season you should check ahead to be sure. Phone: 053-732021, 053-732481, a little English spoken. Taking the earlier left fork... Mom Home is up on the left (see above). On the right is a small guest house called Kitipong House. 300THB. At the end and to the right is the previously mentioned Police Checkpoint. Thip Sukon House Hotel. This hotel is probably the best of the lot on the same road as the old King Kobra hotel.From the 3rd floor you have a view right into Myanmar and the Sai River. Piyaporn Place Hotel. 77/1 Moo1 Weiangphangkhun. (No website - #2 on Trip Advisor) This standard Thai three star hotel is right on the main road about a 10 minute walk from the border. The clean well presented rooms contain all the usual amenities of a hotel in this class. The loud maid phones on each floor which resonate down the corridor may put some off. Ask for a room at the opposite end of the corridor. Standard rooms go for 800 baht except in the core high season of December and January when rates can reach 1,200 baht. Asian buffet breakfast included. From Tachileik (sometimes written as Tachilek), one can travel as far as Kengtung (Thai Chiang Tung) provided you hire a tour guide, 160km away, but to travel to the rest of Myanmar, a visa in advance is needed. Transit travelers can arrange for a visa and can have their passport sent to their port of exit. Some local NGOs  are worth visiting to see some of their humanitarian work. Note that one cannot extend a visa at Mae Sai/Tachilek as there are no Thai consular services. Can only get a non-visa exemption pass (14 or 30 days, depending on nationality) or activate a visa already obtained. This page was last edited on 6 March 2017, at 03:49.